I was doing a little bit of web surfing a couple of days ago, looking for references to my work, and came across this photo on the Jewish Children's Museum site. They asked to use several of my painting images for an art project. 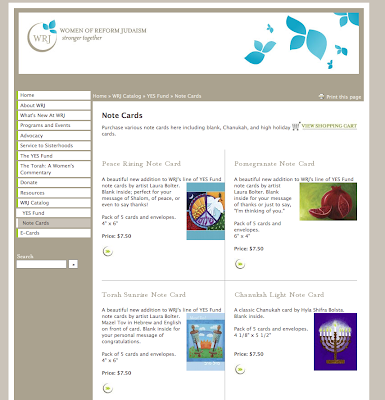 The women's affiliate of the Union for Reform Judaism (URJ), Women of Reform Judaism (WRJ), is also using a few images for their newest YES Fund note cards. It's nice to see the art being used!